In the echo of protests in Portugal this last weekend (15/09), memories and possibilities from the past reappear, take on physical form, masks to reassume and modify for a utopian politics of the present. 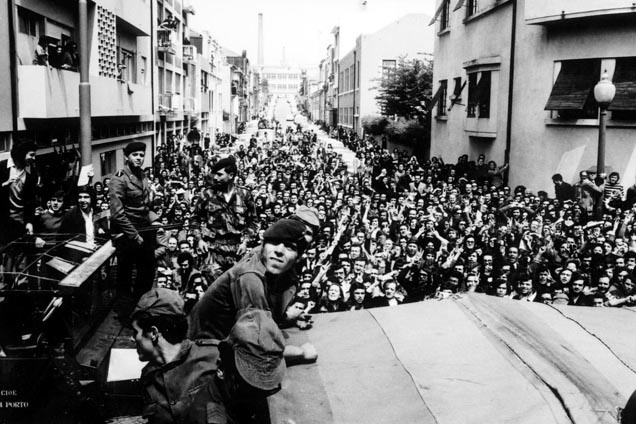 The testimony/intervention of Robert Kramer with Scenes from the class struggle in Portugal in the events inaugurated by the 25th of April find their complement in the extraordinary work of Rui Simões, Bom Povo Português (released 1981, but filmed between April 25, 1974 and November 25, 1975)). Unfortunately, the film is only available in its original language, without subtitles. But even aesthetically, it merits viewing, for it is very often strikingly beautiful. Pedro Neves de Carvalho Santos. O filme foi distribuído comercialmente no Brasil, onde também passa na televisão, estreia comercialmente nos EUA no circuito das universidades, acompanhado pelo próprio Rui Simões que organiza «workshops» e debates com o público. rio, apresentada à Faculdade de Letras da Universidade do Porto, 2006. 2 RAMOS, Jorge Leitão, 1995 – Os Anos do Cinema, Lisboa, Expresso. do Filme de Setembro de 1980 cit in MADEIRA (org. ), 1999: 58. 1982), Lisboa, Instituto de Cultura e Língua Portuguesa. 6 In http://www.realficcao.com/html/Filmes/cinema/Bompovo.html, consultado em 09/06/06. Imprensa do filme, Setembro de 1980, cit in MADEIRA (org. ), 1999: 58. 12 Giuseppe Lampedusa, in O Leopardo, 1963. This entry was posted in Film and tagged 25 de Abril, portugal, revolution, Rui Simões. Bookmark the permalink.